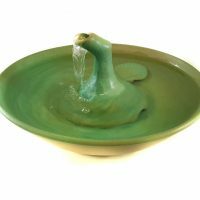 Making ceramics by hand – hand throwing on the wheel, hand-building, then bisque firing, glazing and glaze firing presents an enormous quantity and variety of risks – something can go wrong at every stage of the creation of a cat water fountain. And something often does go wrong. The bowl may become out-of-round, a small surface flaw may occur, the glaze may run and stick to the shelf or the glaze may pinhole. For any serious flaw we simply discard the flawed piece but often there is only a slight cosmetic blemish and these pieces we sell at a reduced price and almost always include a photo and description of the blemish. 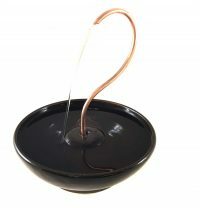 Many people are grateful that we offer reduced cat fountains – it permits them to buy a quality cat fountain for a reduced cost and very often the blemish isn’t even visible. We do not sell cat fountains with flaws that affect performance or are in any way harmful.